Last week, Princeton Council voted against a proposed ordinance to limit ‘free’ parking for users of Princeton’s Public Library. Library users are currently able to validate parking tickets from the municipally-owned Spring Street Garage, to allow 2 hours of parking without payment. The proposed ordinance would have reduced that to one hour, in part to help cover the cost of upgrades to the entry/exit system for the garage. But Council backed off the idea as users and library staff argued that users should not have to pay to park when using the libary. The result is that people driving to the library get parking worth $2.50 provided for free, while people arriving on foot or by bike get nothing. It’s time for people arriving without cars to get rewarded too. Council Member Jenny Crumiller, quoted in the ‘Packet’, made the brave (and entirely correct) point that “The truth is that there is no free parking, someone has to pay for it.” That is particularly true when it comes to a parking deck that has substantial operating costs. Subsidies for parking are one example of the many small ways in which government favors driving, and reduces the incentive to walk, use a bicycle, or take transit. If every library visitor used it, ‘free’ parking could be argued to be just as necessary for library operations as, say, electricity. But many people walk or bike, and these people deserve at least equal treatment. Walking or cycling reduces downtown congestion, air pollution, and carbon emissions. The Library should therefore offer a choice to its customers: either to validate parking, or get some other reward. 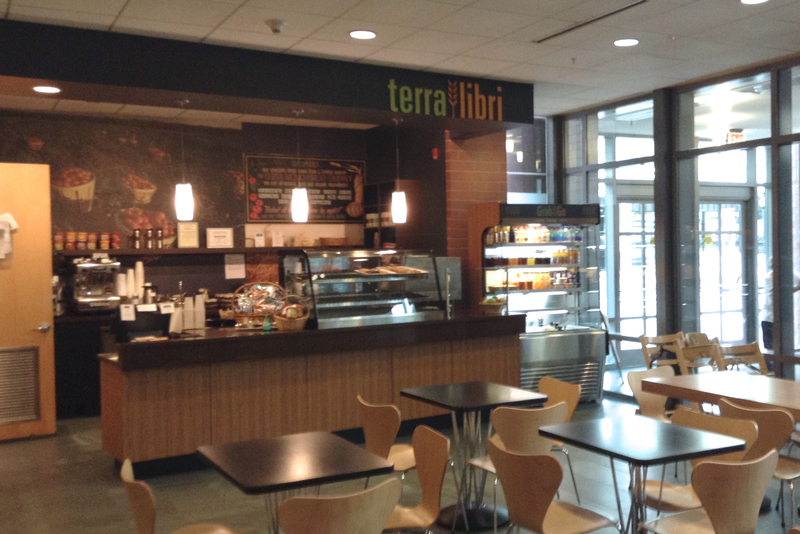 That reward could be as simple as a voucher for a beverage from the ‘Terra Libri’ café (pictured above). Or the Library could institute a ‘Library Bucks’ program, allowing users to earn credit that could be used for DVD rental (or to pay overdue book fines!). Either way, in 2015, it is bizarre, and basically indefensible, that the Princeton Public Library provides a special perk only to its users who arrive by the most-polluting mode of transportation. This entry was posted in Alternative Transportation, Community, Princeton, Sustainability, The Parking Question, Traffic, Walking and tagged Cycling, library, Parking, Princeton, Walking. Bookmark the permalink.